What was the voice of New York City in the early twentieth century? Italian immigrant Joseph Stella painted and O. Henry wrote their impressions of the essence, or voice, of this mighty city. New York dazzled and overwhelmed newcomers with its bright lights, towering skyscrapers, omnipresent sounds, and crush of humanity. In this lesson, students view Walker Evans’s photograph Brooklyn Bridge and Joseph Stella’s paintings Brooklyn Bridge and Voice of the City Interpreted. They read O. Henry’s short story “The Voice of the City.” Then, they create an artwork interpreting the voice of their community and write a comparison of their community’s voice to that of early twentieth-century New York City. Four worksheets to stimulate thinking are included. + Describe New York City during the early twentieth century. + Describe art styles that influenced artists Joseph Stella and Walker Evans. + Analyze the composition of Joseph Stella’s paintings and Walker Evans’s photograph of the Brooklyn Bridge. + Explain how Joseph Stella and Walker Evans utilized composition to create their interpretations of New York City. + Interpret O. Henry’s quest for the voice of the city. + Create an artwork that interprets the voice of their own community, and then write about it. Students analyze relationships of works of art to one another in terms of history, aesthetics, and culture, justifying conclusions made in the analysis and using such conclusions to inform their own art making. Grades 9–12 Visual Arts Standard 6 Making connections between visual arts and other disciplines. Students compare characteristics of visual arts within a particular historical period or style with ideas, issues, or themes in the humanities or sciences. After viewing the short film, explain that they will see how two artists interpret New York City. Show students the entire view of Joseph Stella’s The Voice of the City of New York Interpreted, 1920–22. Students can view these artworks on their computers, projections, or paper copies. Students can answer the questions on Worksheet 2 Joseph Stella, Voice of the City individually or cooperatively in groups. Have students share what they learned about their panel with the whole class. Return to the entire view of Voice of the City. Stella arranged these panels like an altarpiece, suggesting his awe or reverence for this great city. Why do students think that Stella placed The Skyscrapers in the center? Activity: O' Henry's "Voice of the City"
Have students read O. Henry’s 1909 search for the essence of New York City in his short story “The Voice of the City.” Students may read “The Voice of the City” online or on paper printouts. An online audio recording of this story is also available. This story could be read outside of class. O. Henry is narrating this story set in New York City in 1909. In his search for the voice of New York, he questions Aurelia (probably his girlfriend or wife), bartender Billy Magnus, a policeman, magazine poet Bill, and a newsboy. Before beginning his quest, he describes the voice of a big city as “the composite vocal message of massed humanity.” By the end of his story, he seems to have discovered that it is all those human voices and attitudes melded with the actual urban sounds. Reread the poet’s description of these sounds. Who is telling this story? What is the setting for this story? What is the author’s quest? List two people whom the author questions in this story. Compare O. Henry’s “The Voice of the City” to Joseph Stella’s Voice of the City. How are they alike? How are they different? As students compare Stella’s and O. Henry’s The Voice of the City, they will note that although both have the same subject, Stella’s painted description is abstract and O. Henry’s written description is so focused on small details that it seems abstract. O. Henry emphasized people and their relationships, while Stella is dazzled by movement, rhythms, lights, and technology. Have students create an artwork that suggests the voice of their city or hometown. This could be a painting or a photo collage. They may use topics listed in the graph below to help them brainstorm. Remind them that they may choose to abstract their subjects as Stella and Evans did in their art. Students should write a description of their art and their community’s voice, explaining how the essence of their community is both different from and similar to New York City in the 1920s. They should consider various inventions, technology, and means of transportation then and now. Students may use Worksheet 4 to help them organize these similarities and differences before they begin their artwork. Have students photograph or draw a distinctive structure on their school campus. Encourage them to experiment with a variety of viewpoints so that, like Walker Evans, they can create an almost abstract image of this structure. New York City prospered during the exuberant 1920s as the wealth of the United States almost doubled. Manufacturing increased by sixty percent. As European immigrants and migrants from the rural South flooded New York, it became a city of ethnic villages. In 1900, New York City’s population was just under three and a half million, but by 1920 it was home to more than five and a half million people. Manhattan hummed with assembly-line produced automobiles, the rumble of underground subway trains, and harbor horns and whistles. By 1900, New York’s electric lights and cinemas were dazzling newcomers. In 1883, when traffic first began crossing New York’s East River, the Brooklyn Bridge was the longest suspension bridge in the world. The bridge connects the boroughs of Manhattan and Brooklyn. German immigrant John Augustus Roebling and his son Washington Roebling designed it. After thirteen years of construction, its neo-Gothic stone towers became the tallest structures in the Western Hemisphere. Learn more about the history and design of the Brooklyn Bridge from Ken Burns’s American Stories, Brooklyn Bridge, and PBS’s Building Big. Gelatin silver print, 6¼ x 4¼ in. Walker Evans turned his childhood photography hobby into a profession. 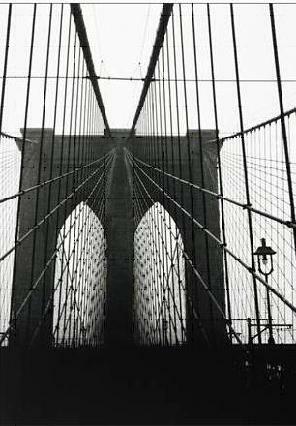 After a 1927 trip to Paris, where he was inspired by modern abstract art, Walker began photographing the Brooklyn Bridge. By 1929, the bridge was no longer new or awe-inspiring, but Walker viewed it from unusual angles and viewpoints, turning his images into almost nonobjective, dynamic forms. Learn more about Walker Evans and his Brooklyn Bridge photograph in Picturing America’s Teacher Resource Book, Chapter 13A. Read this page online or make paper copies for students. Walker Evans also documented American life in photographs for the Farm Security Administration during the Great Depression. oil and tempera on canvas, 99¾ x 270 in. Giuseppe Michele Stella was born near Naples, Italy, in 1877. When he was eighteen, he immigrated to the United States and adopted the English version of his first name, Joseph. He attended medical school and then pharmacy school before enrolling in the New York School of Art (now Parsons The New School for Design), studying under William Merritt Chase. Seeing New York through the eyes of an immigrant, Stella wrote of feeling closed in among the buildings: With “the sky and the countryside blocked off, we are beset from morning to night by the multifarious crowd that weighs down on us.” During three years of art study in Europe, he was inspired by Italian Futurism. This style featured futuristic themes associated with movement, speed, and technology. In his Voice of the City, Stella depicts a fanciful future for New York. Learn more about Joseph Stella and his painting Brooklyn Bridge in Picturing America’s Teacher Resource Book, Chapter 14B. Read this page online or make paper copies for students. William Sidney Porter was born in 1862 near Greensboro, North Carolina. When he was twenty he moved to Texas, where he herded sheep on a ranch for two years before moving to Austin. There, he married, worked as a draftsman at the Texas General Land Office, and eventually became a bank teller. Porter was convicted of embezzlement and sentenced to five years in federal prison in Columbus, Ohio, when in 1894 a federal bank examiner discovered inconsistencies in Porter's records. While in prison, Porter began writing under his pen name, O. Henry. Magazine readers enjoyed his adventure stories set in the southwest U.S. and Central America. After his release from prison, he relocated to New York City, where he wrote short stories that were often humorous descriptions of ordinary New Yorkers’ lives. "The Gift of the Magi" and "The Ransom of Red Chief" are among his most famous short stories. Thomas Edison's Inventions in the 1900s and Today: From "New" to You! Any views, findings, conclusions, or recommendations expressed in this publication does not necessarily reflect those of the National Endowment for the Arts. 12 noon - 5 pm.